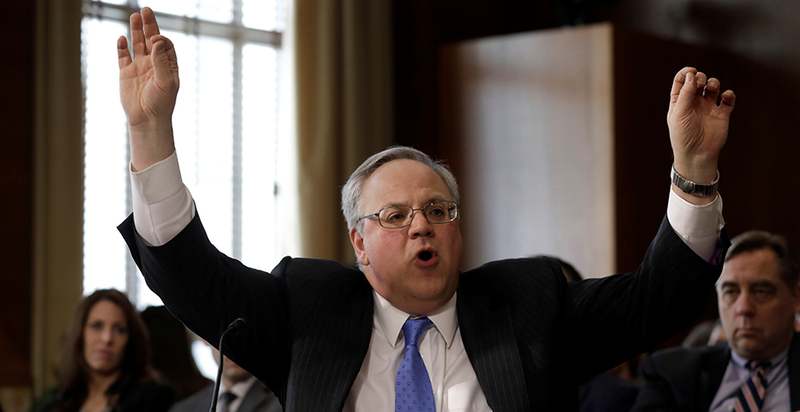 David Bernhardt has his work cut out for him once he finishes celebrating his confirmation as the Trump administration's second Interior secretary. Approved by the Senate yesterday on a 56-41 vote, and officially assuming the office at 9 last night, the lawyer and former lobbyist already recognizes many of the looming challenges through his service as Interior's hands-on deputy secretary since August 2017 (E&E News PM, April 11). "He knows the department inside and out," Sen. Joe Manchin (D-W.Va.) said yesterday. But now, the buck stops with him. The 49-year-old Bernhardt will be the decider in a way he wasn't while serving as the backup to former Interior Secretary Ryan Zinke. Bernhardt has a roster to fill, with gaping vacancies in key positions. He's got, by his own account, a departmental ethics program to fix and an ambitious reorganization scheme that critics decry or simply dismiss. Learning from Zinke's fall, Bernhardt will have to avoid unforced errors and maintain White House support. He'll have to cope with a multibillion-dollar national parks maintenance backlog and thread the needle with an offshore drilling plan. And as he's already discovered during his short stint as acting secretary, he faces opposition from Democratic lawmakers in control of the House. They are now pressing Interior about its overwhelmed Freedom of Information Act program as well as Bernhardt's meetings with former lobbying clients. More questions will come (Greenwire, April 10). More than two years into the Trump administration, potentially debilitating vacancies still riddle the top levels of the Interior Department. Eight positions requiring Senate confirmation are empty, including two assistant secretary slots and the directorships of the Bureau of Land Management, National Park Service, and Fish and Wildlife Service. The lingering vacancies result from a blend of Senate foot-dragging, White House tardiness and old-fashioned political indecision, and they have forced Interior to rely on a revolving series of acting officials whose temporary status weakens them bureaucratically. Now, Bernhardt must help propel existing nominees, such as would-be solicitor Daniel Jorjani, while doing what he can to unclog the White House personnel pipeline in order to free additional names. His first task will be to wrangle his own successor as deputy. Bernhardt blames preceding administrations for shortcomings in Interior's ethics program, and has already stressed his intention to fix it. With ethics complaints now a weapon of choice in Washington, his success or failure will be consequential. "For too long, the department's ethics program has languished," Bernhardt wrote this month. "We must promptly transform the ethics program to meet the challenges of today at a faster pace." Bernhardt directed the department's ethics officer to develop a plan within 30 days to consolidate the various Interior bureaus' ethics offices into a single departmentwide office. Democratic senators have already questioned the value of consolidation (Greenwire, April 3). Bernhardt ordered a "technology assessment" of the ethics program to ensure effective tracking of things like training and financial disclosure filing, and he urged development of an "ethics app" that the department's employees could "easily access on their mobile devices." He has also called for Interior to have one full-time ethics official for every 500 employees by fiscal 2020, though the numerical goal befuddles Government Accountability Office evaluators. "Interior officials could not explain how the ratio was determined nor provide a strategy for achieving the goal or evaluating whether the ratio is meeting the needs of the department in the future," the GAO noted last month. Zinke's departure under the shadow of numerous ethics complaints offers an object lesson to Bernhardt: Step carefully. Democratic lawmakers in both the House and Senate will press Bernhardt on what they see as his own ethical conflicts, including his relationships with former lobbying clients from his tenure at the law and lobbying firm Brownstein Hyatt Farber Schreck LLP both before and after he joined the Trump administration. Democratic Sen. Ron Wyden of Oregon recently requested that the Justice Department open its own inquiry into the subject, while the nonprofit watchdog group Campaign for Accountability has said Interior's Office of Inspector General is reviewing its request for a review of Bernhardt and his relationship with California's Westlands Water District. If complaints become a drumbeat, a public official's tenure can turn into a death march. "This is not about Mr. Bernhardt's ethics or his integrity or his qualifications," Sen. Cory Gardner (R-Colo.) said of the ethics issues yesterday. "It is about the fact that he has been and will be effective at implementing an agenda that the other side doesn't agree with." The Interior Department has consistently denied any wrongdoing on Bernhardt's part (E&E News PM, April 8). House Democrats, in particular, will be calling Bernhardt to account on policy as well as ethics issues. Natural Resources Chairman Raúl Grijalva (D-Ariz.) plans to call the new secretary before his panel for a pair of hearings. "The next [oversight hearing] is on the reorganization, and then we're going to do the Antiquities [Act] pullback," Grijalva told the Capitol Hill newspaper Roll Call, adding that he wants Bernhardt present at both events. Grijalva has been a vocal critic of the Trump administration's decision to roll back national monument status on more than 2 million acres of public lands in Utah, slashing the size of the Bears Ears and Grand Staircase-Escalante national monuments in late 2017 (E&E Daily, March 14). Congressional lawmakers are also scrutinizing the Trump administration's proposed reorganization of Interior and its 70,000 employees into 12 "unified regions" that will align the agency's various bureaus along state boundaries and watersheds (Greenwire, Dec. 17, 2018). President Trump's budget proposed $28 million to continue Interior's overhaul of its agencies, adding to the $14.1 million that Congress appropriated for the process in fiscal 2019. A pet project of Zinke, who sought to apply organizational lessons from his own military career, the reorganization plan is now Bernhardt's to defend and adapt (Greenwire, March 11). That budget also revealed that Interior is still pursuing its proposal to move the Bureau of Land Management headquarters — home to about 500 of the 10,000 individuals who work for the agency — to a Western state, another item for Bernhardt to tackle. As deputy, Bernhardt mostly acted as the Inside Man, tending to Interior's nitty-gritty business while Zinke framed the big picture and performed public duties. Now he'll be engaged in more highly visible outreach, like a meeting he held last month with local Colorado officials. Mesa County Commissioner John Justman acknowledged pressing the then-acting secretary on the BLM relocation, according to the Grand Junction Daily Sentinel. "He just kind of laughed; he said, 'Yeah, I think we've heard that before,'" Justman told the newspaper. "Great meeting with Colorado county commissioners this afternoon. The commissioners included some folks who have known me since I was a kid. Great chance to visit about our activities in the great state of Colorado." Bernhardt also plans to update his social media presence, Interior confirmed, including his current Twitter handle @DOIDepSec. Oh, yes, and then there are the actual natural resource policy decisions for which Bernhardt will now bear ultimate responsibility. Interior will at some point roll out the Trump administration's politically fraught five-year offshore drilling plan. The proposed plan for 2019-2024 would open up more than 90% of the outer continental shelf to oil and gas drilling, including parts of the Atlantic, Pacific and Arctic oceans that were previously off the table. Bernhardt told a Senate panel during his confirmation process that he had not seen a final plan yet (E&E Daily, April 5). The issue was a land mine for Zinke, who got in some trouble in January 2018 when he tweeted that he would take Florida's offshore waters off the table after a meeting with then-Gov. Rick Scott (R). Potentially sweeping changes to Endangered Species Act regulations are in the works. The Fish and Wildlife Service and NOAA Fisheries proposed major changes to ESA regulations last summer, aiming to streamline consultations between agencies, alter some definitions in the rules and perhaps shrink some critical habitats (Greenwire, July 24, 2018).